The BACnet Explorer offers complete, “plug-and-play” BACnet Explorer capabilities for BACnet/IP, BACnet Ethernet, and BACnet MS/TP networks. The Explorer enables the user to discover, test, and debug BACnet networks and devices without the need to load drivers and install external RS-485 hardware. 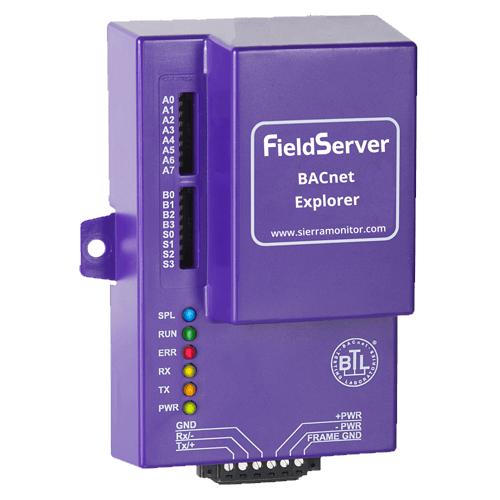 The BACnet Explorer is accessible from a PC, Mac, tablet, or smartphone through a web-based interface resident on the FieldServer. The BACnet Explorer supports simultaneous multi-user access without needing to purchase additional software key licenses per user. In addition to implementing the standard Explorer functions, the BACnet Explorer has BBMD as a standard feature, which enables all BBMD BACnet networks to be viewed for testing and debugging. For testing BACnet devices, the devices can be written to via the BACnet Explorer. The BACnet Explorer has an easy one-page web-based configuration to streamline the analysis of BACnet networks. It also allows the integrator to discover all the BACnet devices connected to the Explorer (including BACnet MS/TP) with one push of a button, greatly simplifying the BACnet network and device discovery process.